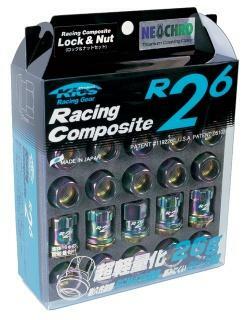 Kicks Project R26 Lug Nuts are for those that demand only the best! 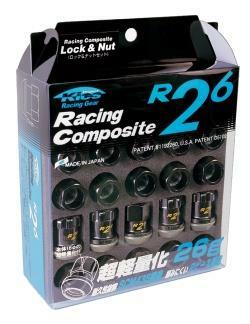 Each kit contains a set of 20 Lugs and Lug Locks for the most complete Lug Nut kit available. Ultra light-weight – Only 26 Grams! Thin-wall construction using strong OEM quality materials. Oversized and taper seat to ensure best contact. External drive by popular 17mm hex for easier installation. Full stud engagement and can accommodate long racing studs. Reliable and stronger than aluminum racing nuts. Lug body produced by Cold-Forged SCM-435 material. Attached rotating taper-seat made with A7075-T6 aluminum and ultra-hard alumite finish. Japan patented (No. 1192260) and USA patent applied.